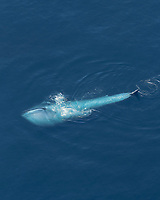 Blue whale images (Balaenoptera musculus) - stock photos, illustrations & facts of the world's largest animal ever to live. 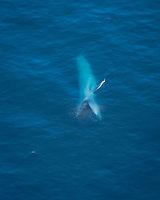 We have the best blue whale image collection in the world from underwater to aerial shots, created by the world’s renowned professional wildlife photographers. We also have many pictures capturing the animal’s various behaviors and anatomical features, including filter-feeding, blowing, spouting, breaching, diving, migration, flukes, bones, skeletons, feces, krill, etc. 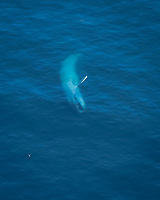 This is your go-to stock photo resource for high quality blue whale images. 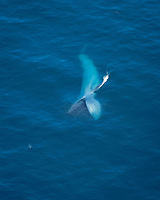 The blue whale, Balaenoptera musculus, is the largest mammal to ever inhabit the ocean. 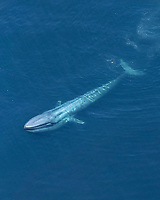 The largest recorded was a 108-foot adult female caught in Antarctica. 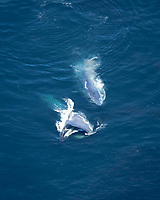 Females are larger than males of the same age, the largest weighing as much as 150 tons, with an average of 100 tons. 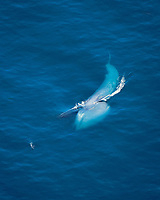 The blue whale is listed as endangered on the IUCN Red List of threatened species. As global warming causes glaciers and permafrost to melt and allow fresh water to flow into the oceans, causing a disruption in the circulation of warm and cold water around the world. 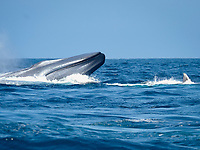 The blue whale's migratory patterns are based on ocean temperature. 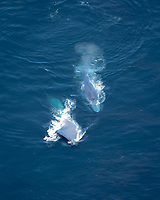 The whales summer in the cool latitudes, where they feed in krill-abundant waters, and winter in warmer latitudes, where they mate and give birth to calves. 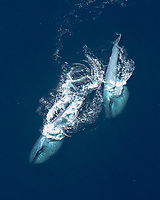 The change in ocean temperature would also affect the food supply as the warming trend and decreased salinity would cause a shift in krill location and abundance. 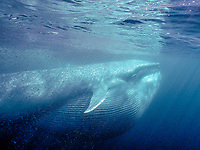 Blue whales are found in all oceans of the world. 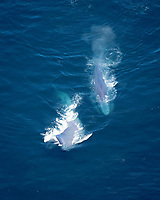 There are four sub-species: Balaenoptera musculus musculus, Northern blue whale which inhabits the north Atlantic and north Pacific; Balaenoptera musculus intermedia, Antarctic or Southern blue whale; Balaenoptera musculus indica, Indian Ocean blue whale; and Balaenoptera musculus brevicauda, the pygmy blue whale. 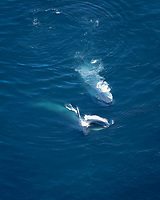 Blue whales are mammals in the order Cetacea, suborder Mysticeti, family Balaenopteridae, genus Balaenoptera. 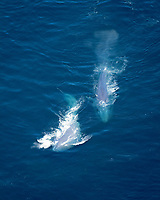 The family Balaenopteridae is commonly referred to as rorquals, a Norwegian term meaning "furrowed whale," a reference to the grooves baleen whales display on their ventral side. The grooves are actually folded skin, which expands when the rorquals take in massive amounts of water while feeding. 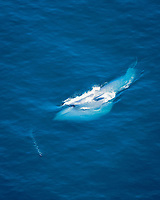 Blue whales feed on krill, also called zooplankton. 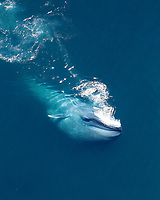 They eat up to 8,000 lbs (3,600 kg) of krill each day. 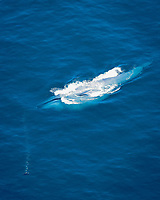 To capture the krill, they must dive as deep as 100 meters (330 ft), locate the mass of krill, lunge at it with their mouth open, sucking in a large amount of water and krill, plus incidental fish and squid that happen to be in the vicinity. 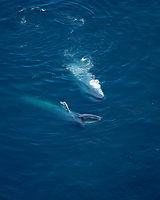 The water is strained through the whales baleen (whalebone), and the krill is swallowed.